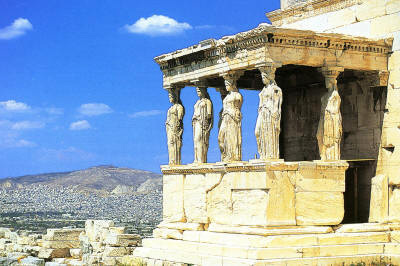 To fully experience the classical beauty of Athens is to understand the essence of Greek civilization. Athens, the “school of Hellas”, and in Pericles’ words, “the city that was an education to Greece”, was the cultural and intellectual well-spring of Greek life in antiquity. During Greece’s Golden Age, the period commencing with the defeat of the Persians in 479 BC to the outbreak of the Peloponnesian war in 431 BC, it displayed a vigour that has no parallel in the history of man. And this golden age glowed brightest during the 30 years it had the leadership of the political genius of Pericles, the city’s first citizen, austere aristocrat, soldier, orator, and statesman. The major strength and inspiration of Athens’ intellectual and cultural vigour was its democratic form of government, the first true democracy in history. The process began by Cleisthenes in 507 BC was completed by Ephialtes in 461 BC: equality before the law, equality of power and freedom of speech. The ancient Athenians expressed their say in political matters using ballots or pottery shards called ostraka. Every time the Athenians suspected their politicians of aiming at tyranny they were voted out of office (ostracised). The Athenians were, thus, ever mindful of the need to maintain a balance between personal ambition and public interest. Athens was also a talkative town. It was ruled by its orators and Pericles became its leader because he was the best orator. All major decisions were reached by the Ecclesia, or Assembly of all adult male Athenian citizens, which met 40 times a year at the Pnyx, a natural hillside amphitheatre that seated 18,000 and was dominated by its rostrum, or speakers podium. In addition there was the Boule, a 500-man council, all of them citizens over the age of 30, chosen by lot. The Boule met daily, with a sub-committee called the Prytany of 50 members which was available day and night, making decisions that were pressing and preparing the agenda for the Assembly. Among decisions reached in the Assembly during the golden era were: to pay fees for public service, thus making office holding possible for the poor; to reconstruct the temples destroyed by the Persians; and the fateful decision to fight Sparta. To ensure adequate attendance at a dull Assembly meeting, police with long ropes dipped in wet paint ushered citizens to the Pnyx. The composition of the Prytany changed 10 times a year, and its chairmanship, the Chief Executive position of Athens changed every day. This position was available to only one class of men: the 10 generals of the armed forces who were elected directly from the Assembly for a year’s term and could be re-elected any number of times. Pericles dominated the affairs of Athens from 460 to 429 BC. He had a dream for his city; to make it great in more than one sense of the word. He was determined to enlarge the maritime empire and express the glory of Athens in visible form. It is to his insight, powers of persuasion and inspiration that we owe the great buildings of the Acropolis whose ruins still inspire men. The Acropolis, or “High City”, is a testament to the Golden Age of Greece and includes the Parthenon dedicated to Athena Parthenos the Virgin; the Propylaea, the great gateway which functioned as a gallery and meeting place; the temple of Athena Nike; and the Erectheum. Originally the Acropolis constituted the entire fortified city, but it spread down into the valleys over time. Destroyed by the Persians in 480 BC, it was rebuilt, great walls enclosing it. In the Agora below stood stoas or open sided markets where the philosophers taught; the Bouleuterion where the Boule met; the mint; the Strategeion or military headquarters; numerous temples and altars dedicated to the various Olympian gods; and the temple of Hephaestus which is still in remarkable condition. Three mighty men collaborated on the Parthenon—Phidias, sculptor and general director; and Ictinus and Callicrates, the architects. Their greatest achievement, perhaps the greatest architectural work of ancient times, was this temple to Athena, the spiritual centre of Athens. In appearance it is a columned rectangle in Doric style. In reality it is a splendid series of refinements that taken together produce optical harmony: horizontal lines curve in the middle; the fluted column shafts bulge in the centre, taper at the top and lean slightly inward; and flutings diminish in width as they rise. Iron in the marble gives the structure a golden glow. The north and south walls were blank. The temple received its light from doors facing east and west. Religious ceremonies and public worship were held at altars outside the temple; the interiors were for private prayers. There were two rooms within the Parthenon. In one room were treasures of the temple including the Persian king Xerxes’ silver-footed throne on which he had sat and watched his forces being defeated by the Athenian fleet at Salamis in 480 BC. In another room stood the colossal statue of Athena the Virgin, 40 feet high, Phidias’ masterpiece made in gold and ivory around a wooden core. Clad in sumptuous robes, her right hand held a statue of Nike or Victory, on her helmet was a sphinx and on her breast an ivory medusa. The statue was carried off to Constantinople in the 5th Century AD, where it was destroyed by a fire some years later. A large part of the sculpture from the exterior of the building, however, does survive—the pediments, most of the frieze and a number of the metopes (originally there were 92). The friezes depicted various mythological battles. On the east frieze: the Battle of the Giants; on the west frieze: the Battle of the Amazons; on the south frieze: the Battle of the Centaurs; on the north frieze, the fall of Troy. The east pediment portrayed the birth of Athena whilst the west showed the contest between Athena and Poseidon. The Ionic interior frieze illustrated the Panathenaic procession. The art of the Parthenon was a fine and varied achievement. The sculptures combined the old aristocratic appreciation of fine craftsmanship with the vitality and self-assurance of the new democracy, the essence of Periclean Athens. In their wish to enclose in splendour the sacred sites of the myths concerning the beginnings of Athens, the city architects produced the Erectheum. The edifice is on the north side of the Acropolis where once stood what Homer called “the strong house of Erectheus,” a legendary king. Under a corner of the Erectheum is the tomb of Cecrops, fabled first king of Athens. 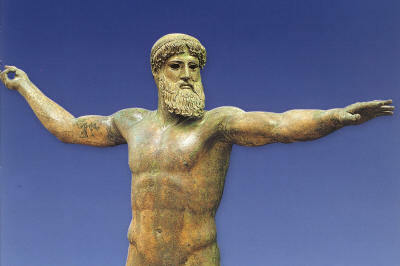 The Erectheum contained the gifts that the gods Poseidon and Athena gave the city in a competition to win its devotion. There were the marks of the blazing trident which Poseidon used to strike open a well of sea water and the well itself. In a courtyard was the gnarled first olive tree of all time, which Athena gave the city and thereby won both the contest and the hearts of the city’s people. Legend says the tree, destroyed by the Persians, sprang to life once they left. To encompass all of these things the Erectheum became a most unusual temple in this land of rectangular temples. It is not symmetrical, is built on two levels and its porches bear no relation to one another. Yet it exudes Ionic grace and charm. The Porch of the Maidens in the Erectheum is a marvellous work of architecture and sculpture, the caryatids holding up the roof in elegant stateliness. Greek theatre was the birthplace of the tragedy and comedy. Greek tragedy, however, differed from modern tragedy in many ways. To begin with it was a religious ceremony honouring Dionysus and was performed at annual festivals at theatres of Dionysus for the whole population. Its theme was the relationship between men and the gods, and its plot usually drawn from heroic myth, illustrated some particular dilemma or message. The plays themselves were short, although sometimes trilogies were enacted and people spent entire days at the theatre. A large part of the performance was taken up by the chorus, which commented on the action at intervals throughout the drama. The actors wore masks representing the character’s mood as well as his role. The great dramatists of Classical Greece presented their works at the Theatre of Dionysus on the slopes of the Acropolis in Athens. From the theatre a long stoa built in the 2nd Century BC leads to the Odeum of Herodes Atticus (2nd Century AD) dedicated to the memory of the founder’s wife. The Odeum is still a venue for artistic events during the summer months. Youngest of the gods in the Greek pantheon, Dionysus was the lord of the good life and giver of wine. Maybe because goats were sacred to Dionysus, or maybe because goats were prizes for the best plays, the highest form of the plays came to be called tragedy, which in Greek meant “goat song”. At each festival a jury of judges judged the plays, and the winners were awarded the Dionysiac wreath of ivy. The three great masters of tragedy in the 5th Century BC were Aeschylus, Sophocles and Euripides. Their works still survive today. The Acropolis Museum at the archaeological site houses sculptures from the Parthenon and four of the six Caryatids from the Erectheum in addition to numerous sculptures and kore dating to the Archaic period. 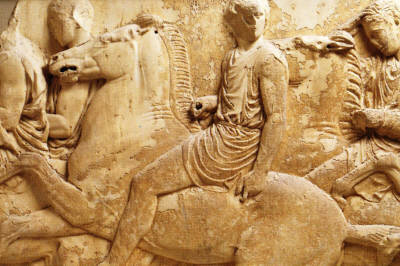 The history of the art not only of ancient Athens, but of all Greece can be seen at the National Archaeological Museum. The highlights are the finds from Mycenae itself and other Mycenaean sites, the bronze statue of Poseidon or Zeus found in the Aegean waters in the 1920s—a work in the austere style, and a fantastic collection of Greek pottery in both geometric, and red and black figure styles. 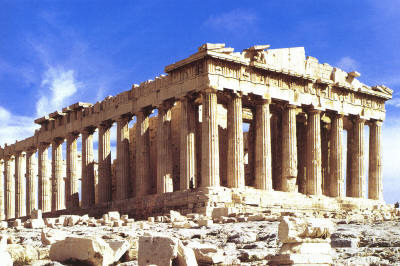 After the proclamation of Athens as the capital of Greece in 1832, the city was redesigned in the neo-classical style. Amongst the most notable 19th Century buildings are the Parliament, originally the Palace of Othon the first king of Greece, and the monument to the unknown soldier in front of it; the yellow Zappeio Conference Centre; and the Academy of Athens, Athens University and the National Library. The latter are exceptionally elegant buildings recreating the essence of Classical Greece. Other interesting sights are Mt. Lycabettus with its little chapel of St. George, Syntagma Square, and the Panathenaic Stadium, a reconstruction of an ancient stadium, built to house the first Olympics of modern times in 1896. In the late afternoon I left for Cape Sunium, the most southerly extremity of Attica. The Athenians worshipped Poseidon and Athena as far back as the geometric period (1000-750 BC) on these cliffs that tower over the sea. The first Temple of Poseidon was built in the 6th Century BC, and was destroyed by the Persians in 480 BC. In its place Pericles ordered the construction of a marble temple in the Doric order, ornamented with friezes. The site has a beautiful view over the Aegean sea. The lonesome columns echo of a time past as they overlook the timeless rising and receding of the waters. Spring flowers tumble though the ruins, greeting one with innocent beauty and smiles. Note: My camera got damaged whilst travelling through Greece and Italy. I have, thus, instead used Photos © Editions D. Haitalis for my Greece posts. This entry was posted in Exploring our World, Greece and tagged Athens, Buildings on Acropolis, Classical Greece, Erectheum, Greece, Greek Tragedy, Parthenon, Sunium, Temple of Poseidon, Things to see in Athens by Rama Arya. Bookmark the permalink.